A judge in northern China has obstructed family and lawyers from filing appeals for Falun Gong practitioners sentenced in January for installing satellite dishes to watch overseas television programs. Judge He Yunpo from Dalian Intermediate Court in Liaoning Province has prevented the defendants from seeing their counsels, and has warned family members not to hire lawyers, telling them “It makes no difference whether you hire a lawyer or not,” reports Minghui, a U.S.-based website which covers China’s persecution of Falun Gong. The judge warned the families to fire their lawyers, or they would risk losing legal counsel entirely, advising them to spend their money instead on food for the practitioners held in the detention center. The practitioners were sentenced in January 2014 to terms of from four to six years for installing the satellite dishes. While in detention, the practitioners were severely tortured, and one of the group of originally thirteen died, while two were so severely injured they were brought to court in wheelchairs. One of the lawyers attempted to submit the appeal documents on Feb. 26, but Judge He refused to accept them, saying his superiors ordered him to reject any paperwork from the lawyers. 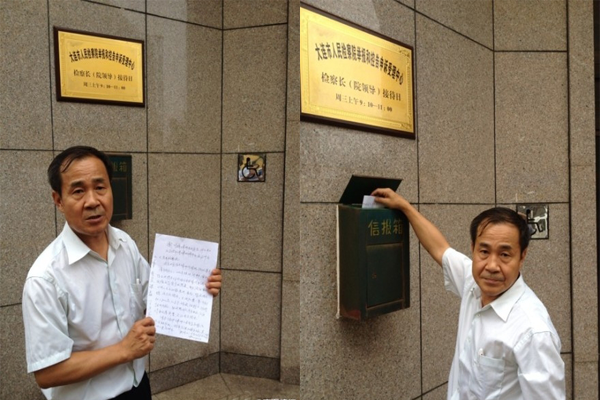 Cheng Hai, one of the defense lawyers, protested outside the court with a banner that said, “By obstructing lawyers’ from filing court papers, Dalian Intermediate Court violates the law,” after Judge He refused to accept documents on March 3. Rights lawyers Wang Quanzhang, Cheng Hai, and Wang Xing encountered uniformed and plainclothes police thick in the courthouse on March 4 when they attempted to file papers stating they would represent the practitioners. They said there were an additional four buses full of officers parked outside the courthouse. The practitioners’ families and lawyers then sought intervention from the Appeals Office, which forced the judge and a court official to meet with the lawyers. The judge again insisted that the lawyers would not be allowed to represent the practitioners, though the lawyers’ cited the illegality of the judge’s obstruction. The detention center authorities have not permitted the lawyers to visit their clients since the sentencing, saying that it is the court’s orders. The court’s refusal to accept appeals is the latest twist in the story of nine practitioners arrested, along with others, in July of 2012 in a sweep that rounded up newly 100 Falun Gong adherents altogether. The nine were tried in December 2013 after several delays and reschedulings, caused by irregularities in procedure. The court abruptly rescheduled their trial in April 2013 but did not inform the families or defense lawyers. Cheng Hai was beaten by uniformed police while outside the courthouse on the day of the cancelled trial. In June, the lawyers were able to enter not-guilty pleas, but the court adjourned after 12 hours because three of the practitioners were too ill to continue. It was rescheduled for July, and then rescheduled again. During the trial in August of 2013, bailiffs beat defense lawyer Cheng Hai and locked him in a room in the court building, after a judge told him that he could not present video evidence on a computer he had brought. The rest of the attorneys withdrew in protest. Chinese authorities tried to conduct the trial in secret on In October 2013 in violation of judicial procedures, and the defense lawyers wrote a letter to the court and posted it online, declaring that the trial was illegal and invalid. The practitioners have been sentenced in a series of secret trials ending in December 2013, when the last two defendants were brought to the brief trials in wheelchairs, apparently unconscious. A rights lawyer was attacked by police after he questioned why a trial for 13 Falun Gong practitioners had been delayed. Eleven lawyers seeking to defend practitioners of Falun Gong in a northeastern city were prevented by police from entering the courtroom.